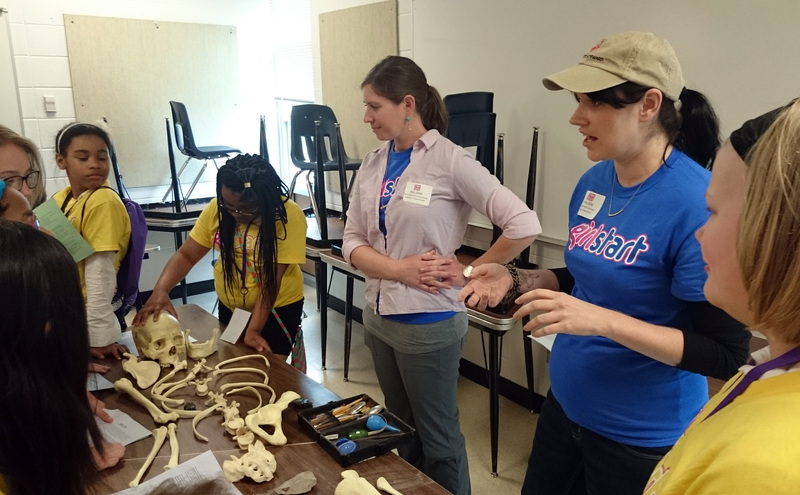 Earlier this month, TARL staff had the pleasure of collaborating with Girlstart, an organization focused on empowering girls through STEM (Science, Technology, Engineering, and Math) educational programs. 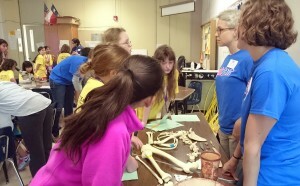 The conference brought together women experts from many STEM disciplines and approximately 600 girls aged 9 to 14 from all over the United States. 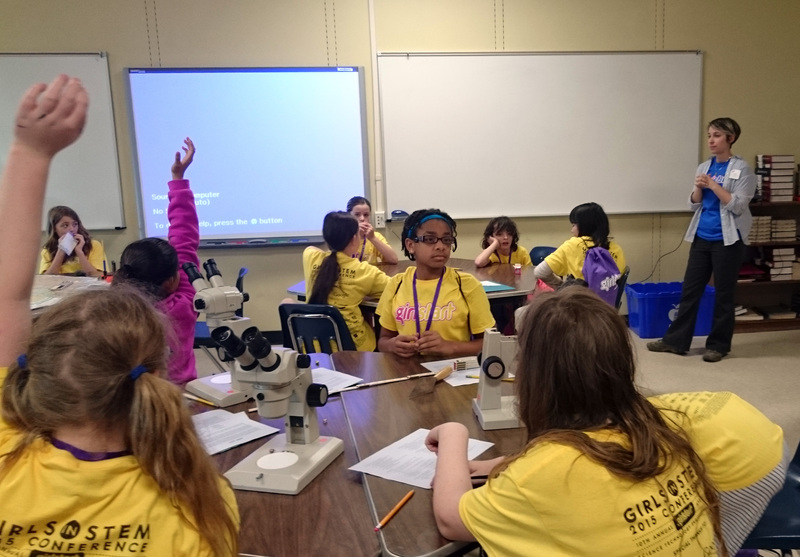 The main goal of the Girlstart conference is promote STEM disciplines as a way to solve many of the world’s current issues, and to encourage young girls to become invested in STEM electives, majors, and careers. Girlstart’s mission is particularly important given the disparity between the recent increase of STEM jobs (currently growing three times faster than in non-STEM careers) and the absence of women in STEM disciplines (only 24% of STEM workforce is female)*. As a lot of archaeological work is scientific in nature, we were more than happy to help Girlstart out! TARL staff Stacy Drake and Debora Trein, along with several amazing UT Anthropology and Geography graduate students, participated in the 10th Annual Girlstart Girls in STEM conference, bringing archaeology to two classrooms full of girls at Travis High School in a session called “Dig It! Adventures in Archaeology”. The Dig It! Team at Girlstart. From left: Debora Trein (TARL and UT Anthropology), Emily Dylla (UT Anthropology), Robyn Dodge (UT Anthropology), Angelina Locker (UT Anthropology), Samantha Krause (UT Geography), Stacy Drake (TARL and UT Anthropology), Luisa Aebersold (UT Anthropology), and Nadya Prociuk (UT Anthropology). Courtesy of Luisa Aebersold. Luckily for us archaeology is a very exciting discipline, so it was not hard to get the attention of the students! 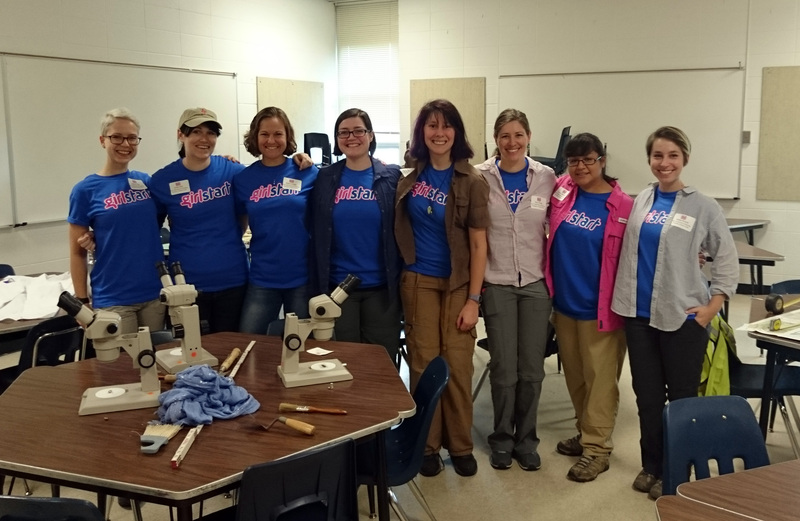 We created two exercises that gave the girls a taste of archaeological research: mini-excavations with mock burials complete with burial assemblages; and a microscope station, with several “samples” to examine. Stacy Drake and Emily Dylla at the “commoner” mock burial. Courtesy of Luisa Aebersold. Debora Trein and Robyn Dodge at the “elite” mock burial. Courtesy of Luisa Aebersold. We set up two mock burials with two sets of reproduction remains and burial goods (one “elite” and one “commoner”). We asked the students: “How old was this person?”, “Do you think that they were a man or a woman?”, “Do you think that they were rich or poor?”, “What do you think they did for a living?”, and other questions that form part of archaeological inquiry. Most importantly, we also asked “Why?” they came to their conclusions. This exercise was intended to get students to go through the archaeological thinking process by assessing all of the available evidence. After getting over the excitement of seeing reproduction human remains and artifacts, it was heartening to see the girls analyzing an archaeological deposit and defending their interpretations! Samantha Krause at the microscope station. Courtesy of Luisa Aebersold. At the microscope station, the girls experienced the flip side to field work, which is laboratory research. 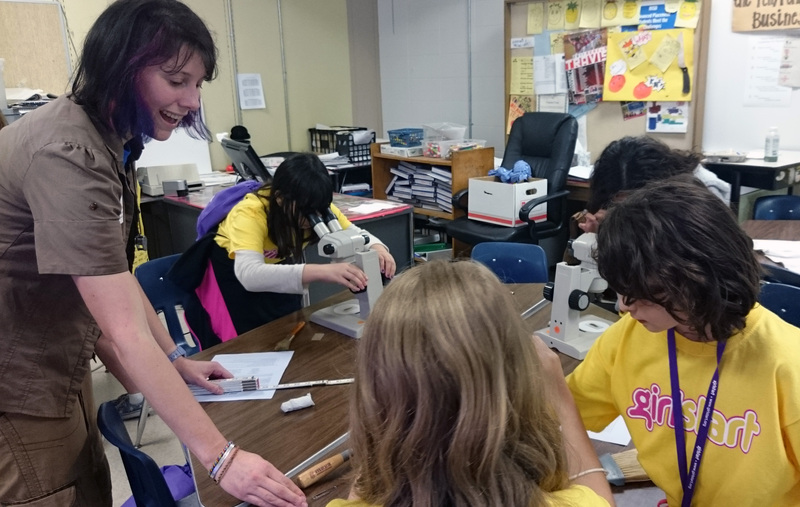 Using three microscopes, students examined many types of materials, including fabric, beads, shell, and sediment thin sections. The girls were able to see how clues that help us explain the lives of people in the past can be microscopic, and that every part of an archaeological context is important to a complete understanding of past societies. They also got to go through our tool kits and handled compasses, trowels, and rock picks! Nadya Prociuk answering questions. Courtesy of Luisa Aebersold. At the end, we held a Q&A session for the girls. It was important for us to relay that in addition to love of discovery, knowledge about people in the past can only come from hard work (both physically and intellectually), collaboration, and respect for material remains that we handle and the people they represent. Archaeology is fun, empowering, and it is definitely for women! We are looking forward to the 2016 Girlstart Girls in STEM Conference! Bring it on!